Rising seniors are beginning to be bombarded with snail mail from colleges all over the country. All those pamphlets can become overwhelming quickly, and it's tempting to just throw everything in the trash (if you're anything like me, that's the first thing you do when you get them). Though they may seem like spam mail, they do hold important information and are worth a second glance. However, if pamphlets and e-mails still seem too boring to read, here's the next best thing: college fairs. College fairs are excellent resources that usually occur in the spring, which is a great time to attend one: the weather is warmer, standardized tests are over, and your teachers are probably beginning to egg you on about college. It might seem like a chore, but college fairs can be really exciting, and you might even end up getting free stuff. Your school is a great place to start looking, but if they don’t host one, don’t worry. You can find a college fair wherever you are! And when you finally get there, here are the 10 things you should ask about your schools of interest. If you can’t fly out to a school to get a feel for the campus yourself, you can always ask the admission officers! They know what goes on around campus and why their students go there, so they are a pretty reliable source for this. But remember, they’re trying to get you to attend their college and will obviously try to show off the campus to you—so be sure to ask what students like the least as well. Whether you can’t live without athletics or have never even considered playing a sport, this is a good thing to investigate. A college you may have never considered could have dozens of awards in your favorite sport and a big fan base, which creates a fun, spirited atmosphere. Ask about their NCAA division and the recruiting process if you’re interested in joining a team (or their club and intramural sports scene if you’re less serious). Extracurricular activities may have been all the rage in high school, but in college…well, it’s pretty much the same thing. You’ll want to ask about your particular interests. See if the school has a club that suits your needs or allows you to start your own. This is especially important to building your résumé and making new friends—what better way to meet your future best friend than through a common interest? You’ll want to treat yourself after midterms and finals, or just for completing a long assignment. Either way, it’s important to know what kind of entertainment outlets are available near campus. If de-stressing at the mall is your thing, or you just really like art, it might be important to ask about popular attractions in the surrounding area that match those interests. Going to college can scare some people because of the challenges it poses in remaining connected to their culture. Or maybe you want to go to a university where you’ll never have to struggle in finding a significant other. Whether it’s race, gender, or age, it’s important to get as much information as you can about the student demographics of a school. If you already have an idea of what you want to study, you should ask if the school carries that major or program just in case. If you don’t know what you want to do, asking about the programs they do have—including exploratory studies for undecided students—can help out a lot. You never know; you may find your true calling standing in front of an admission officer at a college fair. 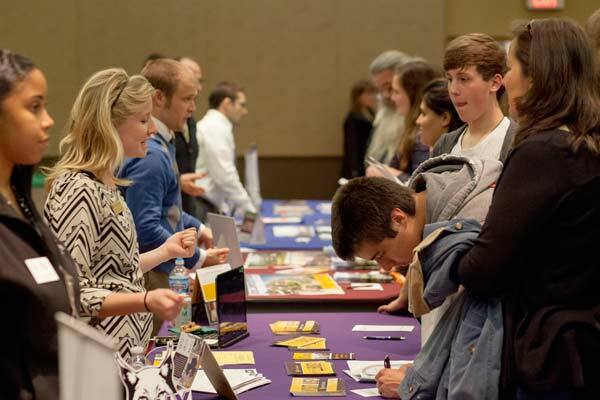 You may have heard about safety, match, and reach schools already, and a college fair is the perfect place to find some. It’s essential to ask about test scores so you can see where you fit in with the students accepted to those schools. Sometimes it’s better to know that you probably won’t get into a certain school than to spend money applying and get your hopes crushed. Maybe a school has a planetarium like no other, or various psychologists available on campus to talk to you about the college struggle. A university should have basic student resources, but it’s distinct ones like these that can really change your consideration of a school. This is the perfect time to find out where you can indulge in your bookworm habits or follow a new passion with resources available on campus. Nothing is worse than finding out your dream school won’t give you an appropriate amount of financial aid. Rather than spending the next decade of your life in debt, ask about financial aid opportunities the school provides, like work-study programs. This will come in handy when you are filling out the FAFSA next year. This is not totally necessary to ask about, but it’s cool to know if there’s a Hollywood legend or famous scientist you could join in the list of notable alumni. Related: Check out alma maters of actors, musicians, professional athletes, and more with our College Lists and Rankings. You’ve made it to the end of this list—now all you have to do is head to a college fair and learn as much as you can. Just don’t throw away all the pamphlets you receive! And be sure to organize all your research with our College Search Spreadsheet.